When the moon hits your eye like a big pizza pie…. Most people think vegans can’t have pizza because of the cheese. 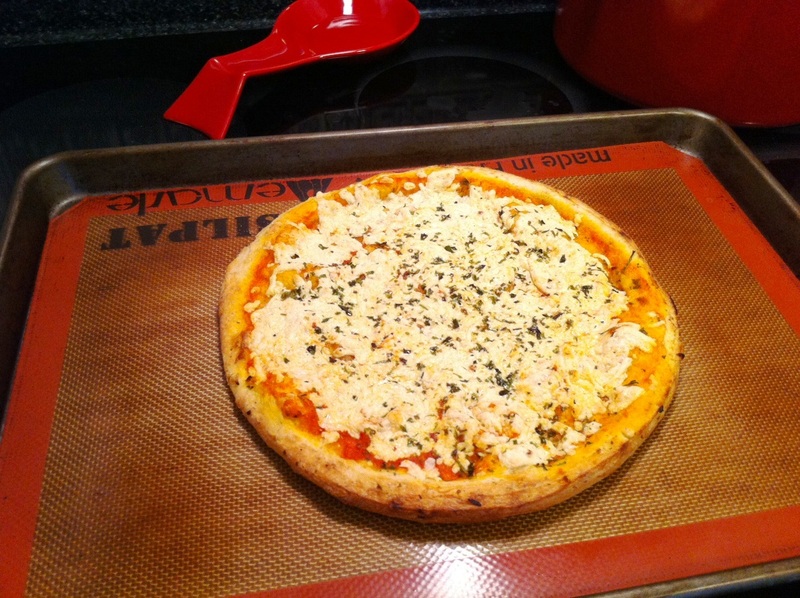 Cheese-less pizza can be extremely satisfying and easy to order. Just go to any restaurant and ask for their veggie pizza without the cheese (the vast majority of pizza crust is vegan). Want that ooey, gooey cheesy goodness? You’re in luck! 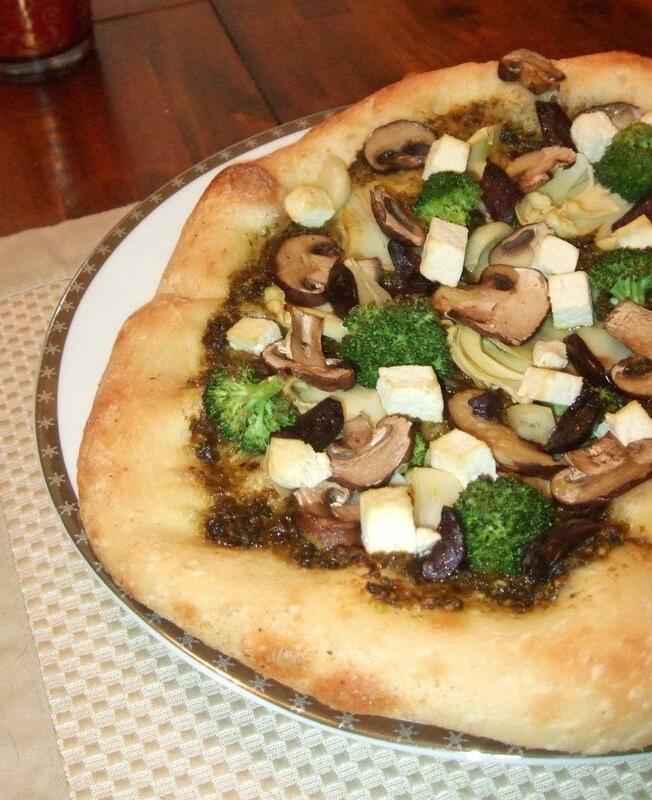 There are several kinds of vegan cheese out there that can top a pizza pie and melt! Daiya is my favorite and the most popular – it’s carried by Mellow Mushroom, Dellz, and a growing number of restaurants. Check out the photos below of both varieties and pop a pizza in the oven tonight! Or – if you don’t have time to spin and toss that dough in the air while singing your best “That’s Amore” – just order in! But you won’t want to order from Domino’s – they refuse to move away from the use of gestation crates in their pork supply (Gestation crates are cruel, tiny cages where sows live nearly their entire lives). OK, here we go! Can you handle the pizza glory? 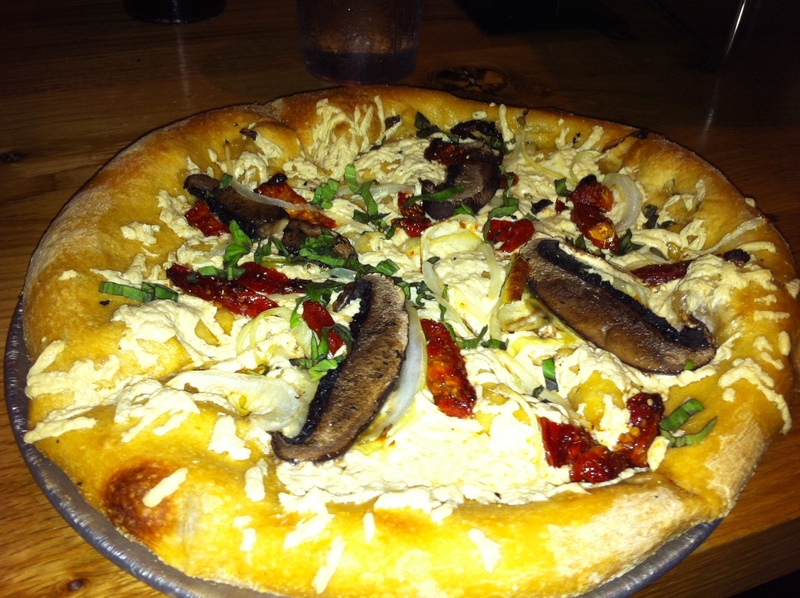 Here’s a hot fresh vegan pizza I ordered at Mellow Mushroom over the weekend. I ‘built my own’ but modeled it on their ‘gourmet white.’ It featured an olive oil base, Daiya vegan mozzarella cheese, portobello mushrooms, onion, sundried tomatoes, and fresh basil. It hit the spot! 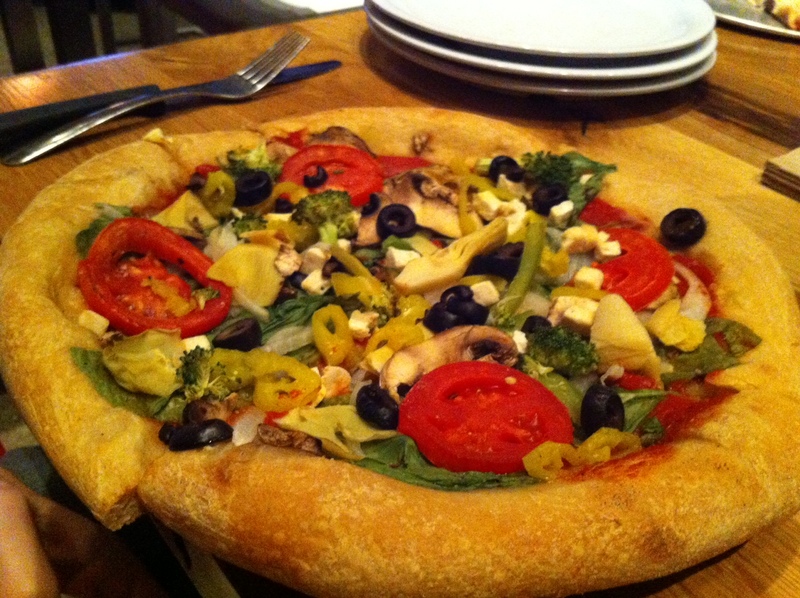 Also from Mellow Mushroom, the mega veggie without cheese was Hanes’ pick. Delish! Just tell them you’re vegan and they’ll leave the butter and parmesan off the crust too! Here’s a semi home-made vegan pizza (we bought the dough at Whole Foods) with sun-dried tomato/basil/garlic pesto base, topped with broccoli, mushrooms, kalamata olives, roasted garlic, cubed tofu, and artichoke hearts. The robust flavor of the pesto and the variety of toppings made this one of my favorite home-made creations ever. Here is a way out-of-the-box pizza (pictured in the box) from Dellz Deli in downtown Charleston. 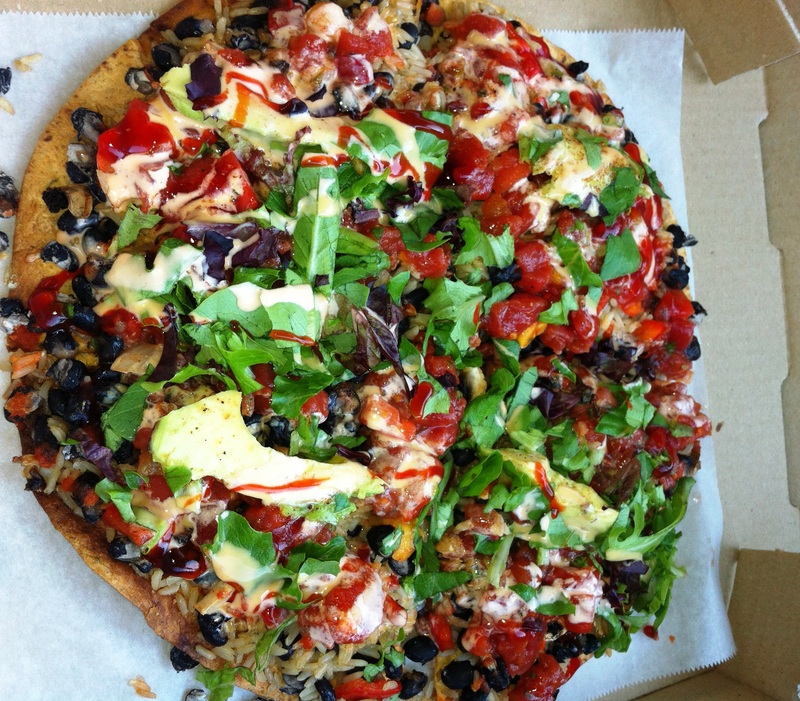 It’s called a Jazzy Pizza, and its tortilla-like crust is piled high with spicy black beans, tomatoes, lettuce, avocado, vegan goddess dressing and hot sauce. It will leave your mouth burning but your belly happy. A million things to do and no time to cook? Not a problem. Toss a frozen vegan pizza in the oven and you have dinner in 10 minutes with no mess. I got this ‘American Flatbread Vegan Harvest’ pizza at Whole Foods. There you’ll find oodles of different kinds of vegan pizza in the frozen section, and they’re available at Earthfare and even Publix too. Are you ready for THE pizza? The mother of all pizzas? 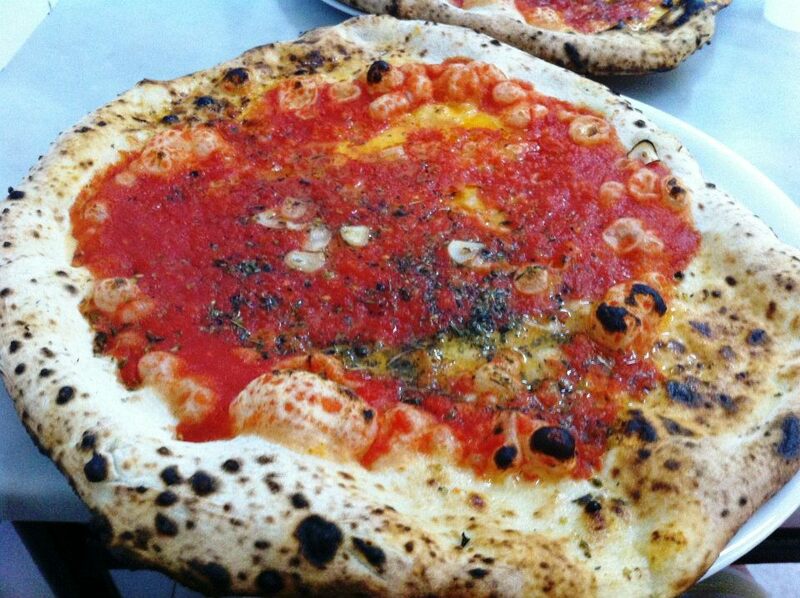 This is the pizza marinara that I had a mini-freak-out-melt-down over at La Antica Pizzeria da Michele in Napoli. My FAVORITE thing I ate in Italy, hands down. I kind of want to cry thinking about how far away this pizza is from me right now. Here’s glamorous Julia Roberts portraying Elizabeth Gilbert in the movie version of Eat, Pray, Love, falling in love with her pizza. If these pictures and that impassioned love poem for pizza don’t make you hungry, I’m not sure what will. So, go on! Throw yourself a pizza party! Stat! P.S. To see a picture of my pizza freak out at da Michele, click here (it’s at the bottom). Sarah! The pizza post was awesome!! I want to eat all of them right now! Thanks, Ashley! They were really delicious. There’s a 100% chance that I will eat pizza for dinner tonight after today’s post!